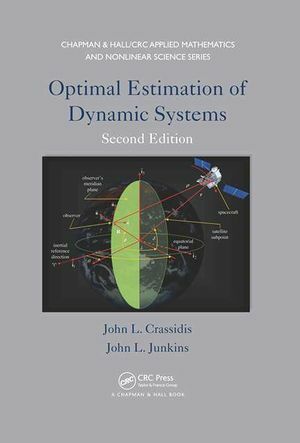 [http://www.crcpress.com/product/isbn/9781439839850 Optimal Estimation of Dynamic Systems (2nd Edition)] provides a significant contribution toward minimizing the painful process most newcomers must go through in digesting and applying estimation theory. Unlike most books written on the subject, this new book presents a solid bridge between theoretical derivations and practical applications to dynamic systems. This work is the outgrowth of the authors’ multiple encounters with the subject while motivated by practical problems with spacecraft attitude determination and control, aircraft navigation and tracking, orbit determination, powered rocket trajectories, photogrammetry applications, and identification of vibratory systems. Several examples and problems related to these applications are given throughout the book, which provide diverse applications across many fields. All of the examples shown in the text have been programmed and simulated using [http://www.mathworks.com/?refresh=true/ MATLAB]. It has been our experience that to thoroughly understand the intricacies of a subject as diverse as estimation theory, one must learn from basic fundamentals first. Although computer routines can provide some insights to the subject, we feel that they may hinder rigorous theoretical studies that are required to properly comprehend the material. Therefore, we strongly encourage students to program their own computer routines, using the codes provided from this website for verification purposes only.